The S&Gs contains all the details that you will need to build your curriculum. All exam questions are derived from the S&Gs. As IITTI is an "open source", "open standard", which means any trainer can build her own curriculum without paying anything to anyone. If you decide to build your own, beware that it is a pretty big job. And you may not have the experience of how to build it. 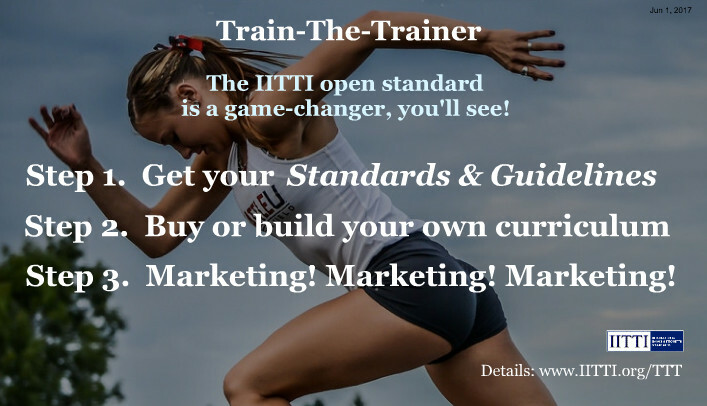 Another way is to enroll in a train-the-trainer program so that you can start your business and marketing sooner. Look under Resources. You can also ask some of the IITTI people for details. Step 3. Marketing! Marketing! Marketing! Now the fun part! Check out the marketing section of this FAQs. This will tell you the reason why IITTI Cellphone Learning is the digital solution that complements your face-to-face offerings. And how you can obtain your own special link so you can start earning passive income. © 2011-2018 IITTI. All rights reserved.